Recently the fourth iteration of Sam Hiti's Fist-A-Cuffs began. Fist-A-Cuffs is a blog where artists submit drawn characters they've created which then 'fight' other artists characters via online votes. And yes, I once again entered a fighter. 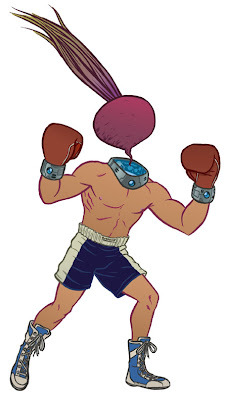 Beetboxer. He lost. Well, not he alone... You see, this time around teams were entered instead of individual fighters. The teams consist of three parts: one manager and two fighters. Each of which are designed by a different artist. Here's the team I entered: Rhythm and Bruise. 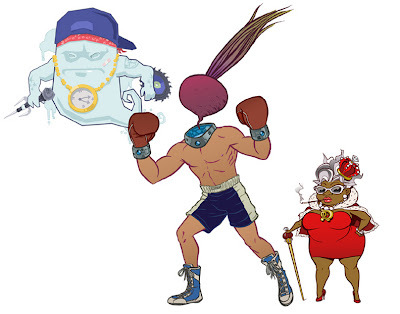 The ghost character - Boo Yah - is by good pal and videogame artist, Juan Diaz. Our manager, Donna Queen was crafted by all around awesome illustrator and designer Matt Westervelt. Head on over to Fist-A-Cuffs to see the surviving teams duke it out. It's totally fun. For reals.